If you read our last blog, you know that obtaining information about the deviations in the boreholes, as well as the different characteristics of the rock formations needs to be accurate and obtained as quickly as possible. Because the tools and equipment used to gather this information must be lowered into the borehole, it’s important that the borehole survey tools used are also reliable and sturdy. The type of tool used in a borehole survey depends on whether or not the rock formation is magnetized. If the rock being surveyed is mostly non-magnetic, then a magnetometer or accelerometer like the MI-5 from Bore Path Services is the perfect tool to use. A magnetometer measures the magnetic field, while the accelerometer measures the gravitational field of the rock formation. The magnetometer and accelerometer are both triaxial — working on three axes — meaning that they can measure the fields in any direction. It is important to use this tool where there is little to no magnetic activity because rocks with higher magnetism will affect the results of the magnetometer. Fortunately, the tool is able to overcome small sections of magnetic rock. For rock formations that are more magnetic, like those containing ironstone or massive pyrrhotite, borehole survey instruments must be non-magnetic. This is also the case if the tool must run inside a metal rod or casing inside of the borehole to protect the instrument. Differential: This method measures the angular differences between fixed points set throughout the borehole. The starting angle of the fixed points are known while the differences are added incrementally at each fixed point to determine the angles of the borehole. This can be measured optically or done by using a system that uses miniature strain gauges to determine the curvature and direction of curvature of the magnetic field. This type of instrument must be run inside drill rods or casing to ensure an accurate borehole survey. Gyroscopic: This method uses inertial navigation to determine the movement of the borehole path. Bore Path Services offers the Gyro Shot® as a gyroscopic borehole survey tool. The tool is triaxial like a magnetometer and can be used in vertical and horizontal boreholes. The Gyro Shot® works quickly to deliver results in 15 seconds and can be uploaded to user-friendly spreadsheets to analyze. The system records data continuously and self-calibrates so you know your measurements are always accurate and reliable. 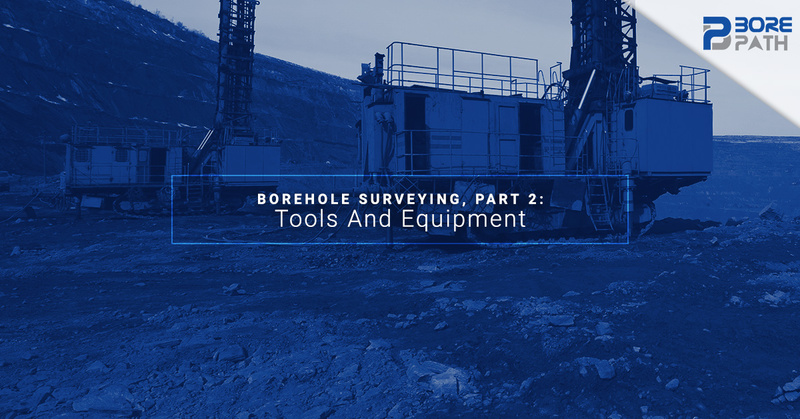 When it comes to borehole surveys, it’s important to survey the characteristics of the rock so projects can move forward safely and effectively. It’s also important to take into account borehole deviations and the magnetism of the rock formations in order to maintain accurate readings with borehole instruments. If you’re part of a company that performs borehole surveys, make sure you’re using the most accurate and durable equipment. Use Bore Path Services.